Many people who become interested in personal finance read “Your Money or Your Life” by Joe Dominguez and Vicki Robin. The basic premise is contained in the title: when you spend money, you are really spending “life energy,” because your life is finite. The authors have you figure out what your REAL wage is, by including not just your 40 hours per week, but also your commuting time, your unwinding time, and so forth. After adding it all up, many are appalled to discover they are making a pittance and that they are exchanging, say, six hours of precious life for a pair of shoes. What the book really advocates, of course, is consciousness and intentionality. The impact of this book can be measured by the fact that when I googled the title (I swapped my book at paperbackswap a while ago), up came hundreds of blog posts. Many readers undergo, it seems, a kind of conversion experience. With my decent but definitely middle-class salary, I discovered some time ago that, for many things, I might as well do it myself. My after-tax hourly wage doesn’t pay for someone to clean, for instance. And Mr. Dr. Frugal Scholar pressure washes our house and even spent many weeks painting the exterior. My obstetrician, in contrast, told us that he never changed his oil; he would read medical journals while waiting at the service station. While the lawyer’s concern for the financial needs of her household help is touching, we should note that by paying them “under the table,” she has saved herself the social security contribution. But I am more interested in the idea that “our time became more valuable than anything.” Do I even need to say that walking a dog is fun? Or that taking care of your children is fun? Do we even think of these things in terms of the wage we are giving up? Amy Dacyczyn, the much-cited author of “The Tightwad Gazette,” muses on something similar. However, in addition to “hourly wage,” she factors “other values” and “enjoyment” into her equation. Thus, changing your oil nets you $28.00 an hour with low scores in the other areas. Making a Halloween costume for a child might net you only $2.00 an hour, but this activity rates high (for Amy! To me this would be a hated activity!) on both other values and enjoyment. See pp. 101-02 of the first book for the whole essay. What Amy knows is that not everything gets a price tag. I suppose I’m lucky that I don’t make enough to turn over all the enjoyable and not-so-enjoyable tasks to hired help. 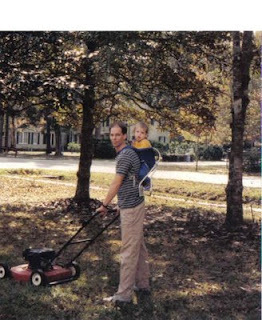 Here’s a favorite memory: Mr. DFS figured out that he could “pay for our whole life” by mowing the lawn. See his blog post on this important discovery. He used to put a child in one of those backpacks while he did this. Both children found this soothing and slept the entire time. I’m not so productive: Do I have to give up sitting around and talking (favorite activity #2)? Or reading (favorite activity #1)? Anyone want to chime in with what’s worth doing yourself? What’s not worth outsourcing? I also factor in fun value, since I pay to have fun (like going to the movies) and substituting other fun things is frugal. Gardening, if you just estimate the value of the produce, "pays" less than minimum wage, but for me it has such a high fun value that I would pay to do it. Hi there, and thanks for visiting my blog. I saw where you are a professor in New Orleans. I took a few night classes at UNO when I lived down there. I like your writing style in this blog. Keep it up! @Chance: so true about gardening. Tightwad Gazette author would concur. @Cubicle: Thanks for coming by! As you know, the feeling is mutual.